Trying to show up your friend’s Dodge Challenger SRT Hellcat Demon at the drag strip? Then Ford’s newest Mustang will certainly help. 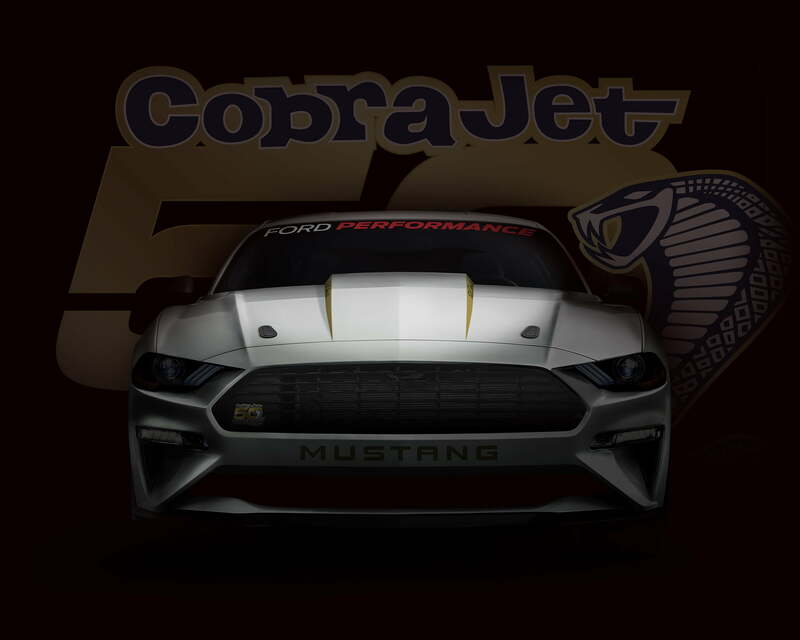 On April 18, Ford Performance teased its latest concoction, a purpose-built Ford Mustang-based drag racer called the Cobra Jet. And it pays tribute to the original competition car from the 1968 National Hot Rod Association (NHRA)’s Winter Nationals. Celebrating the original Cobra Jet’s 50th anniversary, Ford Performance thought to create a modern rendition of the famous dragster. Specifics are very limited, but Ford says the new 2018 Mustang Cobra Jet can tackle the quarter-mile drag in the “mid-8-second range” while topping out at over 150 mph, thanks to a heavily modified, supercharged 5.2-liter Coyote V8. That could only imply that the same 5.2-liter Coyote V8 destined for the next Shelby GT500 is likely at play. According to Ford’s research, that would make it the most powerful and quickest Mustang ever from the factory. Only 68 examples with no VIN numbers – meaning these Cobra Jets won’t be road legal from the factory – will be produced. Other special modifications include a bespoke four-way multi-link front suspension and a specially built Ford nine-inch solid rear axle from Strange Engineering. It also features specifically tuned coil-over suspension and unique Weld Racing wheels, complete with 50th anniversary badging, Inside the Mustang Cobra Jet sits a specially outfitted interior that meets regulations. This includes an NHRA-certified roll cage and Racetech FIA seats. This “turnkey” drag car will only be made in Race Red or Oxford White, with corresponding 50th anniversary badging and other trim bits. Full specification and ordering information will be made available later this summer. So while this Mustang Cobra Jet is promising to be faster than a Dodge Hellcat Demon on the dragstrip, there’s a bit of a catch. Because of the Cobra Jet’s non-legal-road status, your friend will unfortunately still be able to drive his or hers home.